The Naughty Monkey "Exhibit A" gladiator sandal features a funky mix of bold textures—from ribs to braids to edgy studs. The cost for such decadence? $74.95 at Endless.com. 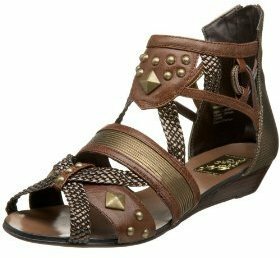 While not identical, these embellished gladiator sandals over at GoJane.com are a fabulous cheap-chic option. Choose from brown, black or tan for just $9.99 a pair. Thanks to reader Danielle for the tip!